I’ll be honest: I thought the Jazz played pretty good defense on James Harden tonight. He scored 47 anyway. This was a combination of both facets of Harden, either of which I think you can argue are the best of any player all time: his incredible step-back three shot-making, and his ability to get to the free-throw line at will, due to seemingly a different set of rules for the ways he’s officiated. 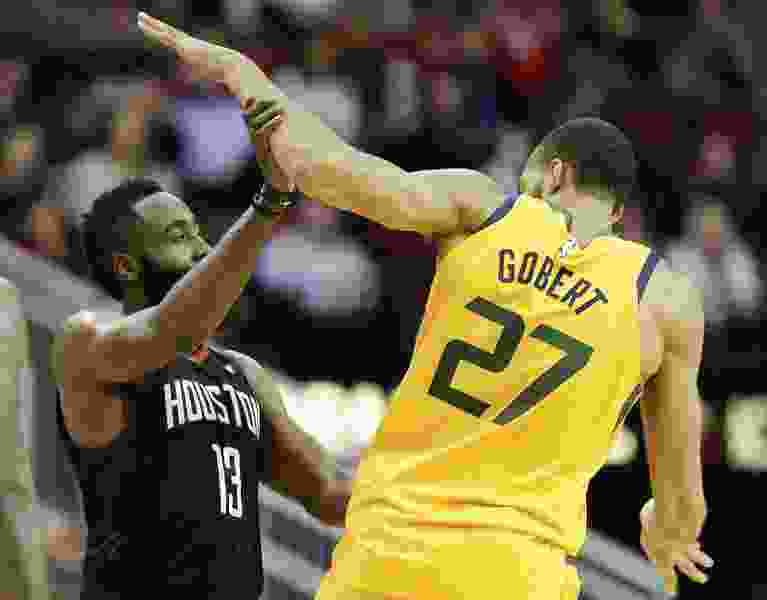 But the Jazz forced him into tough looks, made him shoot less than 50 percent from the field, kept him off of his left hand, forced him into only five assists next to five turnovers, and the Jazz actually outscored the Rockets when Harden was on the court. Harden ended up throwing up a lot of looks like this with his right hand (he’s left handed). This is a really hard shot to make. As were the two step-back threes in the games final two minutes. This is a travel all day, and it’s embarrassing for the league that it wasn’t called. This is, again, the kind of stuff that validates what I hear from people who want to be fans of the NBA but aren’t: “they don’t call travelling in the NBA.” I usually think that kind of stuff is over-stated, but this one wasn’t. Here’s why I think it wasn’t called: Eric Lewis, the official on the play, is watching the ball and Harden’s arm and body for contact. That’s where there’s most likely to be a whistle. Unfortunately, since Lewis is so close, he can’t watch up high and Harden’s feet at the same time. I’m a supporter of having four referees on the court rather than three, and this is one reason why. With Lewis so close, and the other referees having obstructed views, the referees aren’t put in a spot where they’re able to make that call reliably. If there was another outside ref, he or she would have had a better chance of blowing the whistle. Man, this has been a trend. Once again, the Jazz couldn’t score early on in the game, with only 37 points in the first half. The 3-ball, of course, wasn’t going in: the Jazz only shot 4-20 from 3-point land. But believe it or not, the layups were even more disappointing, making just six of 16 shots at the rim. That’s only 37 percent! On dunks and layups! Even the instructions that your father yells at the television screen — “go to the basket!” — wasn’t working for the Jazz. A lot of this was because how the Rockets were playing defense. Rather than switching everything like they’ve been doing for all of last season and most of the beginning of this one, Houston instead played more drop-big defense like the Jazz do, with Clint Capela protecting the rim. That meant that Capela’s shot-blocking presence surprised them, leading to five blocks for the newly-signed big man. That’s an underrated part of the Jazz’s struggles: how they finish in the paint. The stats show that the rim stuff has actually been pretty good this season over the aggregate, with the Jazz ranking seventh in the league from there. But it’s the in-between stuff that they really struggle at, shooting only 33 percent from between four and 14 feet. That includes O’Neale going just 1-17 from that range (6 percent) all season long, along with Jae Crowder (4-17, 24 percent), Ricky Rubio (18-61, 30 percent), and Joe Ingles (13-39, 33 percent). It did improve over the course of the game, and the Jazz scored 60 points in the second half. But their overall offensive rating tells the story: a 94.2 ORtg just won’t get it done on most nights. We saw in Orlando, though, why Snyder does still use the Favors lineup on occasion: against some teams, it works. Favors was the best Jazz player on the floor in that game, and his combination of finishing ability plus defensive size proves problematic for some teams. Here’s an underrated aspect of the decision: the difference between the defensive rebounding of the two. Crowder isn’t a very good rebounding power forward. When Crowder is on the floor, the other team gets 24.8 percent of their missed shots back as offensive rebounds, and when Favors is at the power forward, that drops to 21.7 percent. It’s probably worth about an extra possession per game for the other team. The Jazz are the third-best defensive rebounding team in the league overall right now. Now, is that enough to make up for the extra spacing Crowder provides? Probably not, and that’s why MacMahon’s statistics lean so strongly in the Crowder direction. So I was encouraged to see Crowder get 10 rebounds tonight, including nine defensive ones. And the Rockets had a relatively bad offensive rebounding night, getting only 20.4 percent of their misses back. If Crowder is going to start, the Jazz still need to be able to own the glass, and they did that against the Rockets on Monday.